While in Orlando Florida this past month, I discovered that the Orlando Sentinel runs a regular weekly feature called Wild Wednesday. It features wild life in and around Orlando. Well I just loved it. So Dottie let me keep the pictures out of the paper for me to post them here on my blog. The first picture I saw was this one. 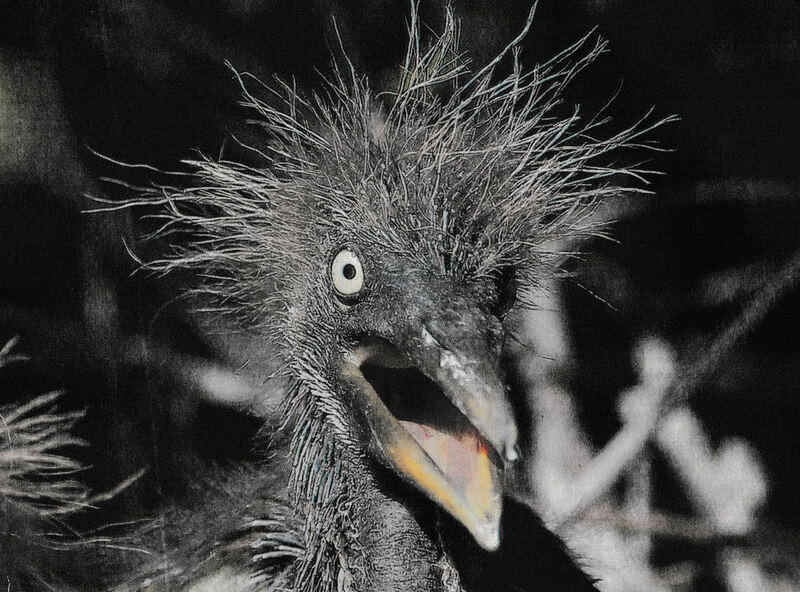 It is a tri-colored heron hatchling from Wkodahatchee Wetlands in Delray Beach. I just think this little guy is too cute. He looks like I feel some mornings. 🙂 Talk about a bad hair day! We drove home from Orlando today. I got a good start on another book. I’m glad I can read in the car. Got in around 6 this evening. Got the car unloaded and just collapsed! Why does it take so much out of you when you travel? Emptied the cooler. We’ll do the suitcases tomorrow. I’m glad to be able to sleep in my own bed tonight. Another Book In the Series. I like reading books in a series, especially when the characters are warm and reading them make as you feel like you are having a nice visit with friends. This is how Ms. Larkin’s Storage Ghost Murders Books are to me. I recommend them for a fun easy read mystery. Another book set in England in a little village. It was a cute easy read with some romance and a murder. If you like those cozy mysteries I recommend this one for you.